SOLD OUT! LOOK FOR OTHER KEM CARDS - Only Available from Kardwell International! 100% Cellulose Acetate Plastic Kem Alpha Playing Card Sets feature a classic, stylish back design that you won't find anywhere else. 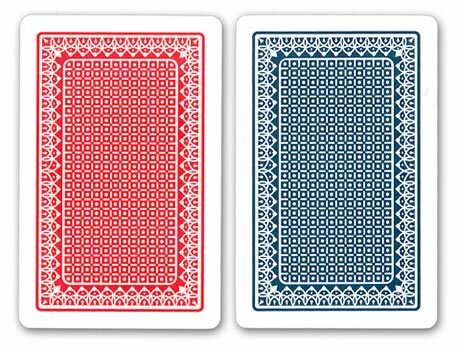 Each two-deck set of Kem Alpha Playing Cards contains one red and one blue deck of Playing Cards. Kem Alpha Playing Card Sets come nicely packaged in sturdy black plastic storage boxes. For additional information on our Exclusive Kem Alpha Plastic Playing Cards, or wholesale pricing, please call 1-800-233-0828.